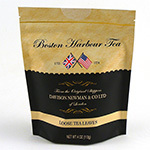 Boston Harbour Tea is a fine blend of select Ceylon and Darjeeling teas. 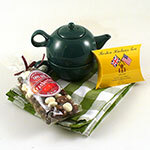 Its sweet aroma and brisk flavor have been applauded by tea connoisseurs for many years. Britain�s oldest tea merchant Davison Newman & Company Ltd., founded in 1650 and whose tea chests were destroyed in the 1774 Boston Tea Party, still operates today and has developed this famous tea blend. 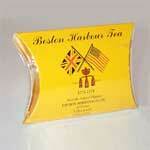 Twenty paper overlay Boston Harbour tea bags are presented in a re-designed replica, wood grained tea chest. 3 �" x 3 �" and is 3 �" tall.